In case you forgot how efficient nuclear bombs are at annihilating everything, these videos will scare you more than any clip since Indiana Jones jumped inside a refrigerator. Actually, that Indiana Jones clip is just scarily bad. 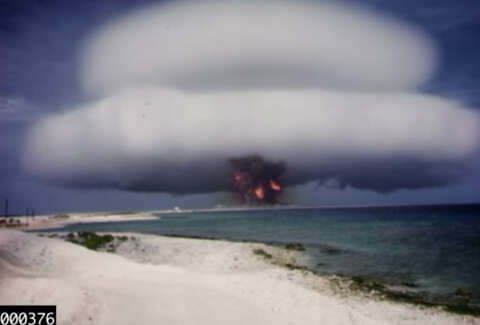 The Lawrence Livermore National Laboratory (LLNL) has released about 60 videos of its library of thousands of declassified nuclear test videos. The lab has spent five years preserving the films and their data that log the United States' 210 atmospheric nuclear tests conducted between 1945 and 1962. High-speed cameras documented terrifying displays of nuclear power from a variety of angles on about 10,000 different pieces of government-classified film. By and large -- with the exception of those you've already seen on old History Channel reruns -- the footage was locked in high-security vaults across the country until five years ago, when a nuclear weapons physicist named Greg Spriggs was tasked with their compilation and restoration them. "We think there were about 10,000 films and we've located about 6,500 of them, and to date we've scanned a little over 4,200 of them," Spriggs says in a video from the LLNL. "We've analyzed maybe on the order of about 400 or 500 of those films." According to the LLNL, "Not only were they gathering dust, the film material itself was slowly decomposing, bringing the data they contained to the brink of being lost forever." The hope is that this effort by Spriggs' team of film experts, archivists, and software developers can get ahead of that decay. In the meantime, their efforts have already netted pretty stunning -- and absolutely terrifying -- footage in a YouTube playlist from the LLNL. We've embedded a bunch you can watch below, along with identifying information for when the nuclear tests were filmed. Video dated May 21, 1958 with a 25.1 kiloton yield. This is the best in-color footage on the playlist. Video dated June 10, 1958. 213 kiloton yield. Video dated June 10, 1958. 213 kiloton yield. Alternate angle. Video dated March 7, 1955. 43 kiloton yield. Video dated September 19, 1957. 1.7 kiloton yield. This is what happens when you set a (relatively low-yield) nuke off underground. Video dated July 15, 1957. 17 kiloton yield. Video dated October 30, 1962. 8.3 megaton yield. Video dated June 12, 1962. 1.2 megaton yield. Video dated March 1, 1955. 7 kiloton yield. Video dated May 14, 1962. 97 kiloton yield. Video dated April 11, 1953. 0.2 kiloton yield.